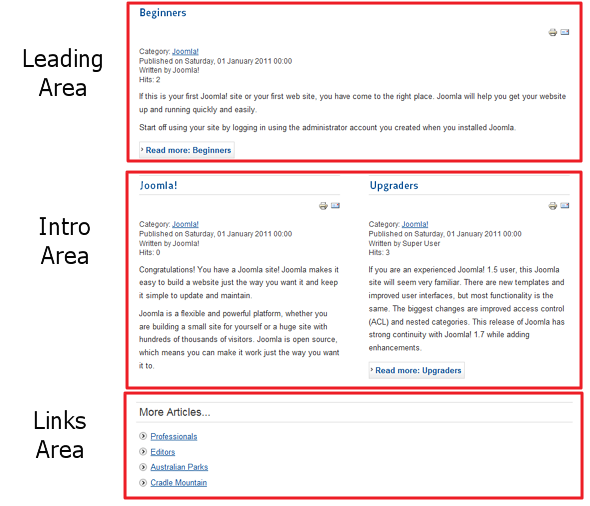 Used to show articles belonging to a specific Category, in a blog layout. 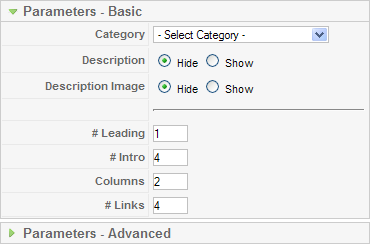 Parameters - Basic The Category Blog Layout has the following Basic Parameters, as shown below. Description. 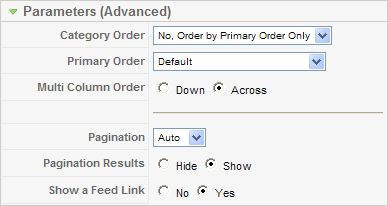 Hide or Show the Category and Section Descriptions on the Layout. If 'Show' is selected, the Description will display above the first Article, just below the Page Title. Description Image. Hide or show the Description Image on the Layout. If 'Show' is selected, the Image for this Category or Section will display on the left or right of the Description, depending on the Image Position specified in the Category Edit Screen or the Section Edit Screen. This page was last modified on 13 July 2010, at 09:44.